The community of Ashland (population 1,361) is nestled in the southeast corner of Cass County on Il. Rt. 125 approximately 25 miles northeast of the state capital of Springfield. The Panther Creek flows near town as well. Ashland has a rich tradition of education and competitive teams in high school athletics. The origin of Ashland High School is not known at this time. 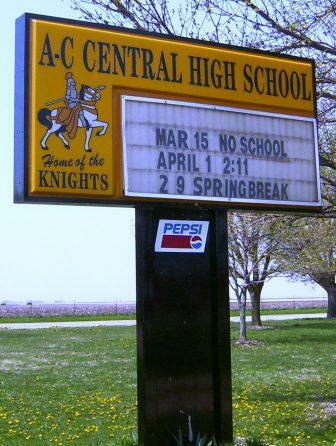 What is known is that the high school districts of Ashland and Chandlerville consolidated in 1989 to form A - C Central High School. The high school students attend classes in the Ashland High School building. In-put is being sought from AHS alumni as to some of the important facts you would like to share regarding Ashland High School. School Fight Song: "Cheer, Cheer for Old Ashland High"
Ashland High School produced some excellent athletes over the years it was in existence. The sport they faired best at according to the IHSA web site was Boys Basketball. The AHS boys brought home seven District Championships! The best of the boys basketball seasons according to the IHSA web site (www.ihsa.org) are listed below. Ashland is also said to be hosts of one of the longest running basketball tournaments in Illinois, a holiday tourney run over Christmas break. Fargo men's team that was successful in the late 70's early 80's. Ashland HS had two individuals bring home medals from the IHSA State Track Meet. In 1908 Ashland High School placed 8th overall at the State Meet. Since there was only one class in those years this is a pretty incredible accomplishment. Below are the state meet award winners from Ashland HS. 1907-08 Julius Timian Hammer Throw STATE CHAMPION!! Girls Athletics were also offered at Ashland HS however there is no information available on the IHSA web site. The girls of Ashland High were introduced to a volleyball and softball program in the 1975-76 school year. We are seeking information on girls athletics as well as any other sports offered by Ashland High School. If you can provide this information please complete a School Submission form. Ashland High School had their fair share of success in the activity spotlight in the 1950's and 1960's. The Debate team qualified for the State Tournament in 1958-59. The Individual Events teams won District Championships in back-to-back-to-back years: 1963-64, 1964-65 and 1965-66. More information is being sought about Ashland High School; use the Guest Commentary Form or the School Submission Form to sumbit. Corrections are welcome as well. If you have more Information about Ashland High School, including photos of the original school building, win-loss records and other great teams you would like to share please e-mail this website at ihsgdwebsite@comcast.net .